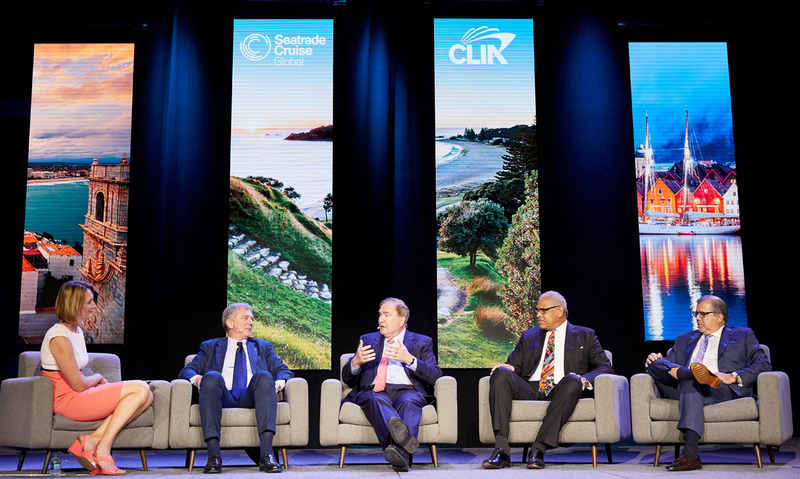 The 2019 Sea Trade Conference held in Miami Beach last week featured a number of industry firsts and demonstrated that the relevancy of the global event is keeping it strong, even as other trade shows are struggling. Returning to its original Miami Beach Convention Center venue after three years in Ft. Lauderdale while the facility was being remodeled, the trade show welcomed more than 11,000 visitors and hosted a record number of exhibitors, said the organizers. With the industry forecasting 30 million cruise passengers in 2019, following a record 28.5 million in 2018, up by nearly 7%, industry leaders see only “buoyant” sailing ahead. According to Cruise Lines International Association, cruising will account for 1.1 million jobs worldwide this year and generate $134 billion in global spending. One indication of the growing importance of the cruise sector was the discussion between Adam Goldstein, vice chairman of Royal Caribbean Cruises Ltd & CLIA, and Zurab Pololikashvili, Secretary General of the UN World Tourism Organization. This is the first time that CLIA was engaging with the UNWTO and they discussed ways that the two organizations can partner together going forward, including innovation and education, sustainability, measurements and statistics. More specifically, CLIA and UNWTO can partner on visa issues and the cruise industry’s investments in infrastructure in developing regions like Africa. The keynote State of the Indus-try is always a highlight of the SeaTrade event, with Arnold Donald, president and CEO, Carnival Corp. & plc. ; Frank Del Rio, president and CEO, Norwegian Cruise Line Holdings; Richard Fain, chairman and CEO, Royal Caribbean Cruises Ltd. and Pierfrancesco Vago, executive chairman, MSC Cruises taking the stage to talk about sustainability, innovation, environmental initiatives, emerging markets and passenger growth. BBC World News’ Lucy Hockings moderated the morning session, and was intent on getting the panel to discuss downside challenges, such as over tourism and environmental concerns. She was so persistent that NCL’s outspoken Frank Del Rio finally called her to task. 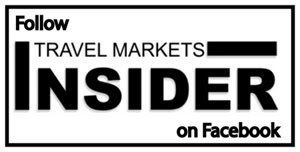 Carnival Corp.’s Arnold Donald pointed out that as strong as the cruise industry is, it will always only be a small part of the global tourist pie: Cruising accounted for only 28 million of the 1.4 billion global travelers in 2018. Growth is “restrained from a capacity view-point” and restricted in large part by the amount of time and investment needed to build new ships. With 18 new builds in the pipeline for this year, over tourism is a growing complaint against the industry, but he pointed out that actual numbers do not support the claim. But since ships are so visible to the public, MSC’s Vaga said that the cruise industry needs to do a better job of telling its story. 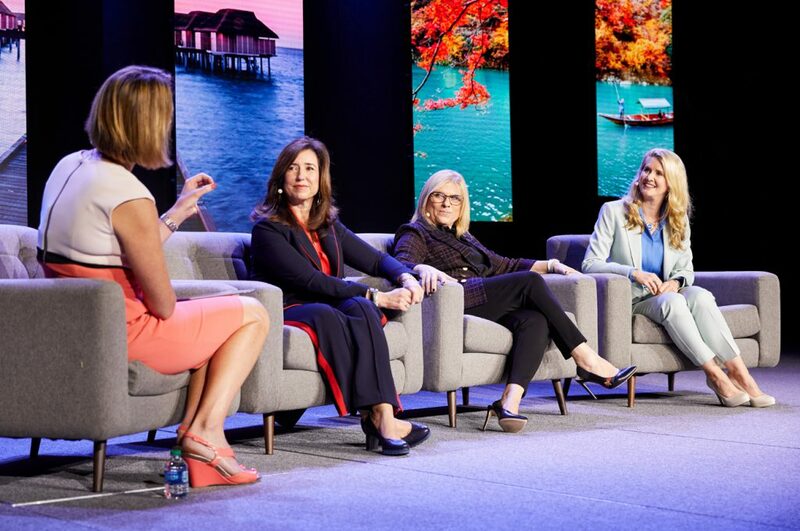 Following the first part of the State of the Industry, SeaTrade featured the three women who head up major cruise brands: Christine Duffy, president of Carnival Cruise Line; Lisa Lutoff-Perlo, CEO of Celebrity Cruises; and Princess Cruises President Jan Swartz Cruises. This was the first time in the 30 years that SeaTrade has been held that the women made it to the main stage. The cruise leaders discussed the progress and challenges they are having increasing diversity—which goes beyond gender they said.